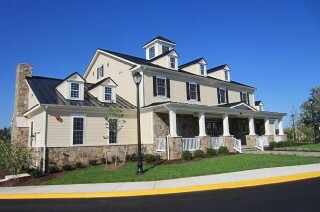 Hubert Completes Clubhouse at Lenah Mill for Toll Brothers | Hubert Construction, LLC. The Lenah Mill Clubhouse, recently completed by Hubert Construction, is a 5,076 SF two story wood framed facility built for Toll Brothers. The building has a resort like feel with it’s large competition pool and beach entry toddler pool with with water feature, constructed by NVblu, surrounded by lush landscape and an ample pool deck. The interior facilities include large community meeting rooms, a well equipped fitness center and a demonstration kitchen, all accessed from the elegant two story entry lobby. This is Hubert’s second facility completed for Toll in 2015, having delivered the clubhouse at Arundel Forest early in the summer. In addition, to the projects completed for Toll Brothers, Hubert has delivered more than 45 other amenity facilities for our clients since 2004, including M/I Homes, Lennar, Winchester Homes, Buchanan Partners, Elm Street, Willowsford, Ryland Homes and Pulte/Centex, among others. Please contact Matt Shea at 301.721.4393 for additional information and pre-construction services.